The Veterans Affairs Department has begun publicly posting all major disciplinary actions taken against its employees, saying the action will send a message about the new culture the Trump administration is imposing at the agency. The postings are the first of its kind in the federal government, VA Secretary David Shulkin said Friday. 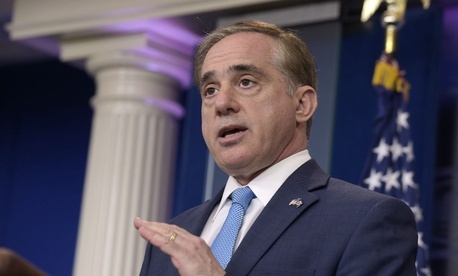 Shulkin has championed reforms aimed at hastening the disciplinary process throughout his tenure and the announcement comes just weeks after President Trump signed a law with bipartisan backing to ease the firing and suspensions of VA employees. The posts will display all terminations, demotions and suspensions of more than 14 days of VA employees since Jan. 20, 2017, the day Trump took office. VA is not including individuals’ names, citing privacy concerns, but the list does include the employee’s component, position, specific adverse action, date it took effect and, in most cases, the employee’s region. VA will update the list weekly and post it on the website for the VA Office of Accountability and Whistleblower Protection, which Trump initially launched through executive order before it was codified in the firing reform law. “Under this administration, VA is committed to becoming the most transparent organization in government,” Shulkin said. “Together with the accountability bill the president signed into law recently, this additional step will continue to shine a light on the actions we’re taking to reform the culture at VA.” He added that the list will demonstrate to veterans and taxpayers that the department is taking definitive action. The inaugural post, which shows actions dated from Jan. 20 through July 3, described 743 disciplinary cases. Of those, 526 were removals, putting VA on pace to fire 1,169 employees during Trump’s first year in office. By comparison, VA fired for discipline or performance 2,575 workers in fiscal 2016, according to data from the Office of Personnel Management, more than twice the number the department is currently set to hit in Trump’s first year. Shulkin has repeatedly complained his hands have been tied due to complex civil service rules designed to ensure employee due process. J. David Cox, president of the American Federation of Government Employees, called the posting a "window-dressing reform" that amounted to nothing more than an "intimidation tactic." The secretary also announced Friday that he will require approval by a “senior official” for any settlement with an employee of more than $5,000.